On August 22, after seven years of bawdy and beautiful weekly performances, Sinner Saint Burlesque took the stage at Noc Noc for the last time before the official closure of their long-running home base. For years, Noc Noc was the best place in town to grab a plate of tater tots, bring all your friends, and settle in for a raucous night of wild and wonderful burlesque. Noc Noc had a certain gritty charm that made the weekly shows feel intimate yet glamorous- if you were new to burlesque “this goes on every week?” would be your first thought; if you weren’t, Noc Noc was a place to watch a group of women and their extended burlesque family come and go, honing their skills, experimenting, and perfecting their art in a no holds barred weekly live performance. Not an easy feat, but they did it- uncensored and for seven years, launching many solo performers along the way. Polly Wood took a few moments this week to talk about the closure, and the photos found here were taken by POC on Sinner Saint’s last night at Noc Noc. Burlesque Seattle Press: What is the story of Noc Noc’s (relatively) sudden closure, in a nutshell? Polly Wood: On July 11, The Noc Noc on 2nd Ave and the historic Columbia building in which it resides was sold and its occupants were given notice to close their doors by August 31 for redevelopment. We decided to close the show a week and a half earlier than the final close date, so that we could have as many Sinner Saint Burlesque members in attendance as possible. BSP: What is Sinner Saint planning to do next? Polly Wood: While our weekly show will be on hiatus, we will be continue to pursue touring options and look at producing larger showcases. 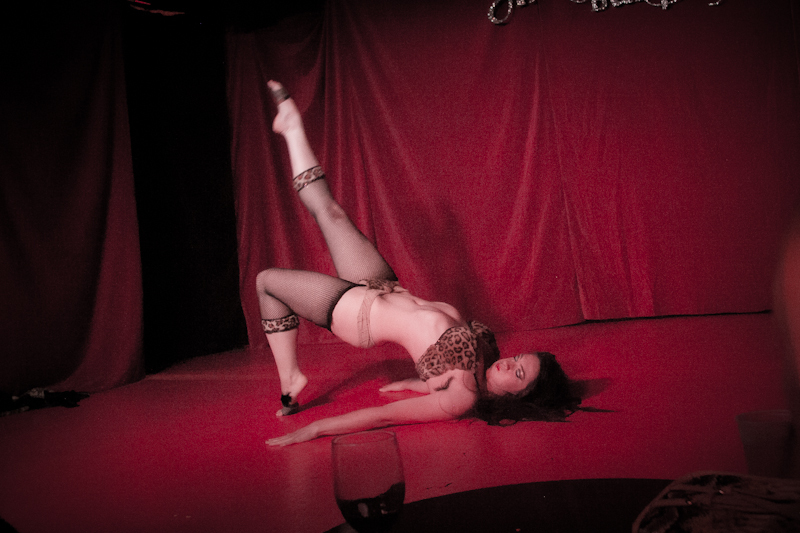 Sinner Saint is also still available for private bookings, both as a troupe and as soloists. BSP: How do the ladies feel about this turn of events for them, historically? Polly Wood: Sinner Saint has been so grateful to have a supportive venue for the past 7 years. Scotty, Jesus, and everyone at the Noc Noc have helped to create an environment where the performers, staff, and patrons feel welcome. Having a consistent weekly venue has helped us create a strong fan base. We have so many awesome memories (and incriminating photos) of the years of fun and art we created at the Noc Noc, and we will miss it. At the same time, we are excited to see what new adventures we will embark on as our business model shifts! BSP: What do you think the closure means contextually…in terms of good stages and burlesque-friendly venues seeming to be tougher to keep open these days? Polly Wood: It’s symptomatic of arts in general, not just in Seattle, but nationwide. While artists are producing amazing material in many mediums and disciplines, the gentrification of neighborhoods that have been havens for artists is a problem everywhere. BSP: What will the impact be of the venue closure for the ladies-both personally as consistently working performers, and for the scene at large? Polly Wood: We will continue to work as soloists, and to produce as a troupe, but obviously, as the Burlesque scene grows, and the availability of venues shrink, we will have to all be creative and enterprising as we work on producing material that is relevant and challenging to the community! To keep up with Sinner Saint Burlesque or to reach them for bookings, click HERE. ~ by angrytruffle on 09/03/2013.